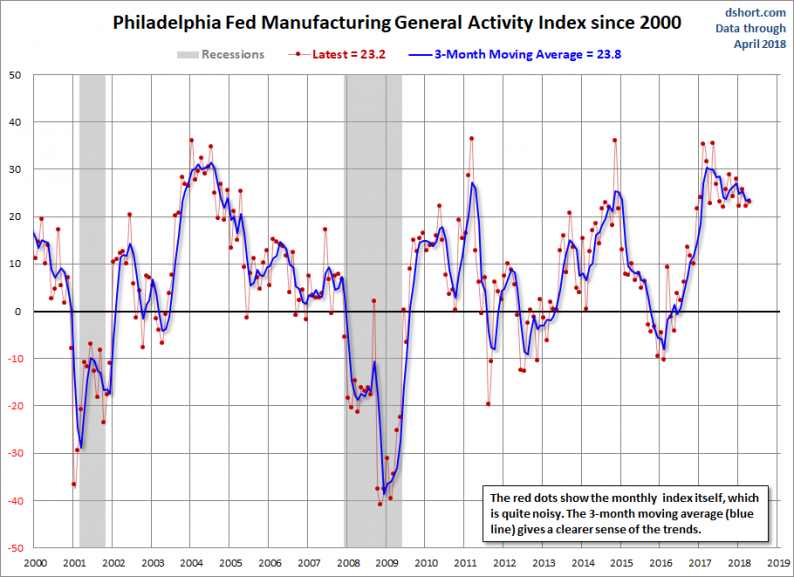 The Philly Fed’s Manufacturing Business Outlook Survey is a monthly report for the Third Federal Reserve District, covers eastern Pennsylvania, southern New Jersey, and Delaware. While it focuses exclusively on business in this district, this regional survey gives a generally reliable clue as to the direction of the broader Chicago Fed’s National Activity Index. The latest Manufacturing Index came in at 23.2, up from last month’s 22.3 and has been positive for twenty-three consecutive months. The 3-month moving average came in at 23.8, up from 23.4 last month. Since this is a diffusion index, negative readings indicate contraction, positive ones indicate expansion. The Six-Month Outlook came in at 47.9, an increase from the previous month’s 41.2. Today’s 23.2 headline number came in above the 20.8 forecast at Investing.com. The first chart below gives us a look at this diffusion index since 2000, which shows us how it has behaved in proximity to the two 21st century recessions. The red dots show the indicator itself, which is quite noisy, and the 3-month moving average, which is more useful as an indicator of coincident economic activity. We can see periods of contraction in 2011, 2012 and 2015, and a shallower contraction in 2013. 2016 saw an improvement only to detract in the second half of 2017. In the next chart, we see the complete series, which dates from May 1960. For proof of the high volatility of the headline indicator, note that the average absolute monthly change across this data series is 7.7.